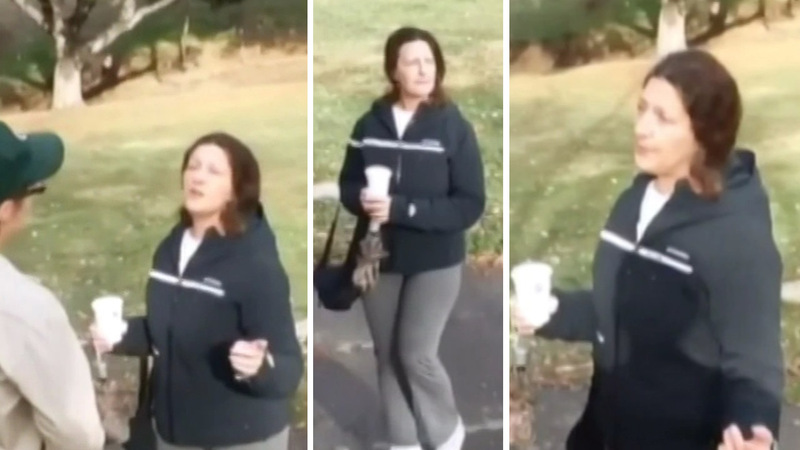 CASTRO VALLEY, Calif. (KGO) -- A woman caught on video shouting insults at Muslim men praying in Lake Chabot Regional Park earlier this month was charged Wednesday with two misdemeanors for the incident, prosecutors said today. Denise Slader has been charged with battery on a school, park or hospital property and violation of civil rights for the confrontation she had with two men on Dec. 6, according to the Alameda County District Attorney's Office. In the video posted online, the woman, identified as Slader, can be seen telling the two men they are deceived by Satan. She later reacts angrily, allegedly hitting him with her umbrella and throwing coffee at him. "We take very seriously conduct that infringes upon our citizens' right to be free of violence and hatred," District Attorney Nancy O'Malley said in a statement. "Ms. Slader's actions must be addressed within the criminal justice system." East Bay Regional Park District spokeswoman Carolyn Jones said last week that Slader approached the men as they were praying by the volleyball courts near the park entrance at about 3 p.m.
She got into a conversation with the men that escalated into an argument, eventually saying things to them like, "Your God is Satan" and "the Koran is evil," according to Jones. That's when one of the men started recording her. Slader is talking at the start of the video, saying, "The people you torture are going to be in heaven. You are very deceived by Satan. Your mind has been taken over, brainwashed, and you've got nothing but hate." A park ranger tries to intervene, telling her she is being inappropriate, but Slader responds that it's inappropriate for the man to tape her. The man taping says, "This lady was talking about my God." That's when Slader allegedly attacked him with her umbrella and coffee. The video does not show exactly what happens, but the man can be heard yelling, "Do not touch me!" The San Francisco Bay Area chapter of the Council on American-Islamic Relations praised O'Malley's decision Thursday, saying that the group has been receiving increased reports of hostility against Muslims in recent weeks. CAIR's office in Santa Clara was itself mailed a suspicious powder in an envelope last week. A similar incident was also reported at the group's national office in Washington, D.C. on the same day. "We commend law enforcement's thorough investigation and swift action following this incident," CAIR Northern California civil rights coordinator Brice Hamack said in a statement. "With the recent unprecedented rise in hate attacks targeting Muslims across the nation, this sends the message that hate crimes will not be tolerated in the Bay Area." Slader, an employee of the state Department of Corrections and Rehabilitation, is scheduled to be arraigned on the charges on Jan. 7.